Earlier this month, Sa and I were supposed to go for a spa date, but end up the staff mis-booked our appointments and we gotta push back the spa-date for almost a month. :( I shall do a review on them after our appointment. 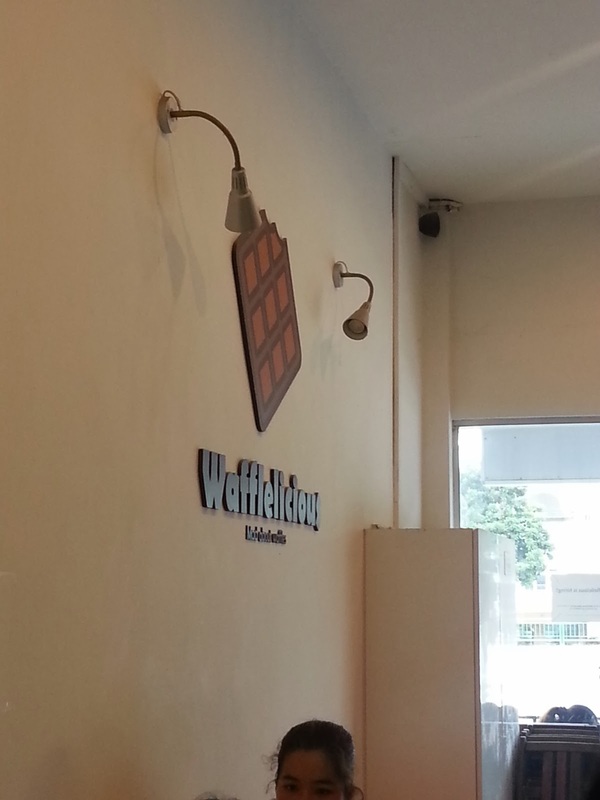 So we were walking randomly along Upper Thomson road and came across this, Wafflelicious! 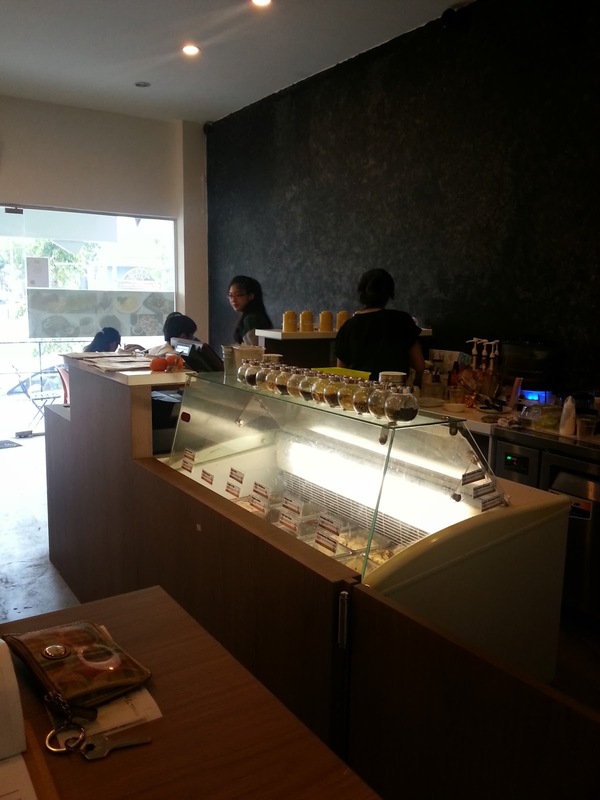 Didn't take too many photos of the cafe interior because it's really simple with not much decorations and just plain tables and chairs placed around. There's a 2nd storey seating area too, but I didn't bother to climb up for a look. 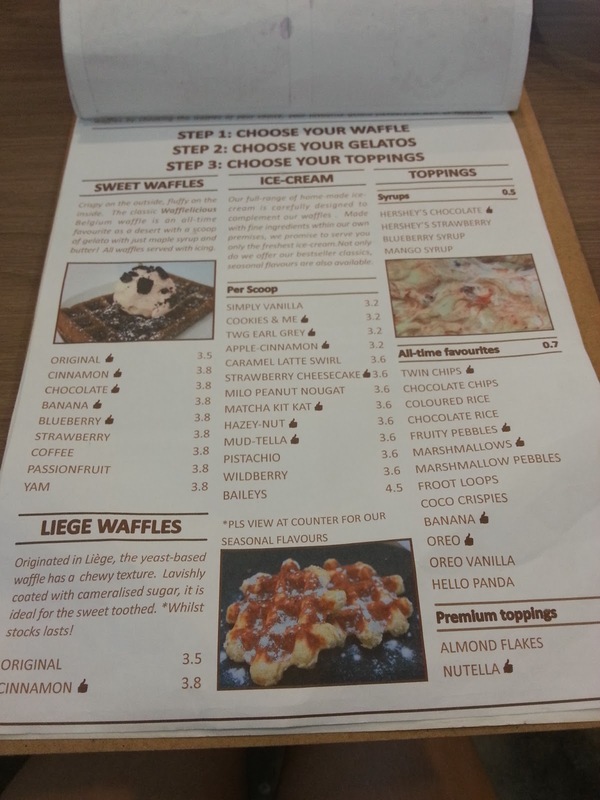 And as you can see, apart from ordering their 'ready-made' waffle combinations, you can also create your own waffles with your choice of waffle, gelato, and toppings. Being lazy us, we just ordered the one with the most appealing picture on the 'read-made' menu, which also happens to be pretty affordable at all hovering below $10. 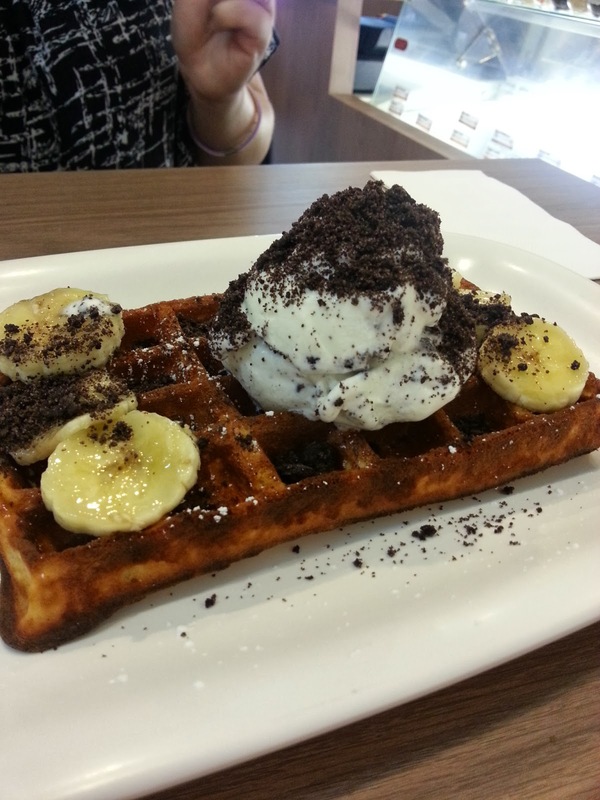 Bananarama - Banana waffles, Cookies & Me Gelato, Banana slices with crushed Oreo toppings. Yeah, boring choice I know. But hey, it's the safest! 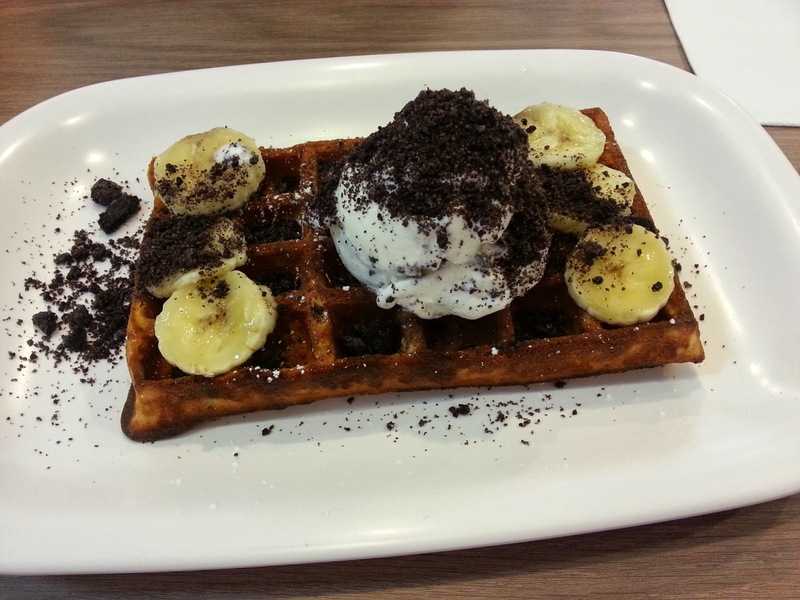 Who doesn't like banana waffles, topped with cookies & cream (they called it cookies & me) gelato? What's more, you'll find generous bits of mashed banana inside the waffle itself! 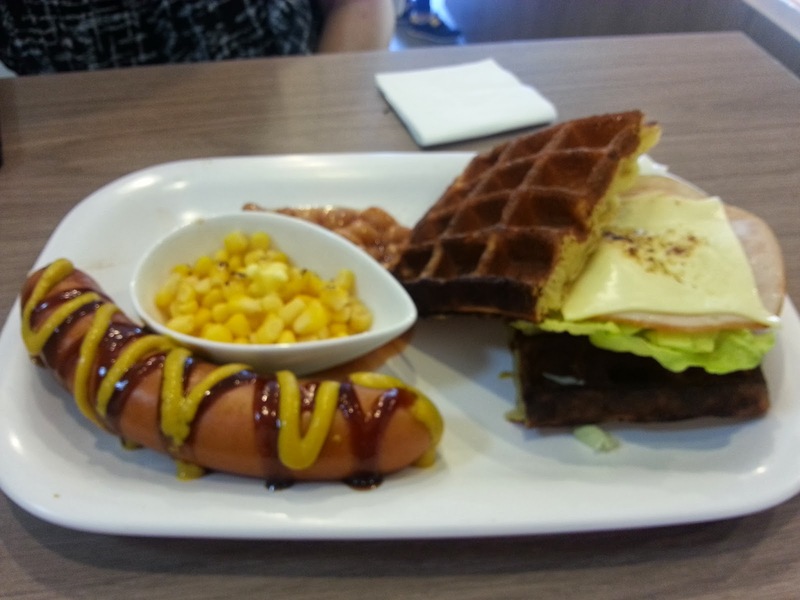 As you can see from the pictures, our waffle was baked till fully browned and crispy on the outside. Just my perfect style of belgium waffles! They're still pretty soft and fluffy on the inside, though definitely not moist (it's either moistness or crispiness, take your pick. I'll go for the crispiness anytime.) but still really good! I can hardly remember tasting any waffles in SG that are baked till crispy yet doesn't end up like a cookie, crispy and dry throughout. The gelato and amount of banana slices are pretty generous with respect to the size of the waffle, so we need not worry about ending up with just plain waffles with insufficient toppings/gelato to go around. But actually, there's already bits of mashed bananas mixed into the waffle itself so it's impossible to end up with a plain waffle anyway. Both Sa and I agreed that it's actually surprisingly good, giving the fact that we really just did walked by without knowing it's there, randomly decided on having waffles, and even more randomly popping in and ordering this Bananarama off their menu, which turned out yummy! After polishing off the waffle and indulging in a while of catching up, Sa's eyes started wandering back to the menu and she finally said, "You know what, I wanna try out the savoury waffles too. They look interesting!" 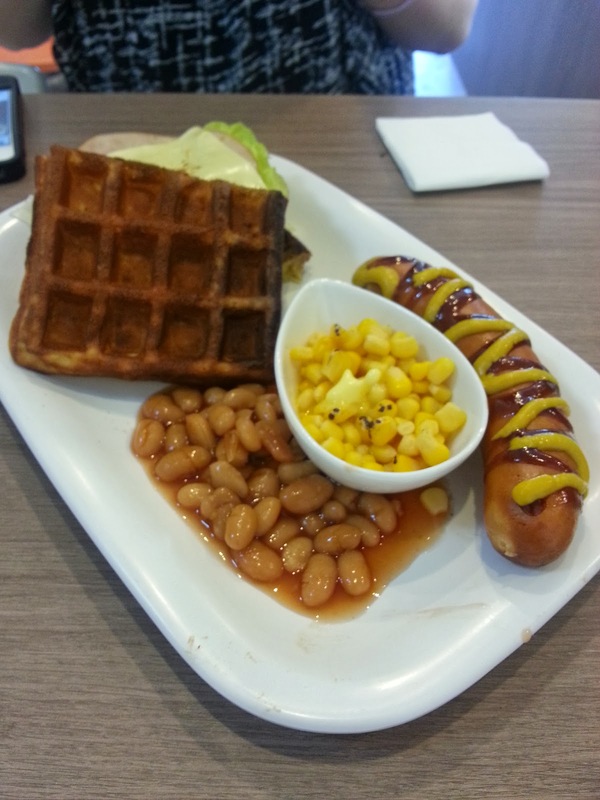 And so, we ended up with one more savoury waffle on our table. Wafflelicious W.i.C.H - A 'sandwich' made out of plain waffles, parmesan cheese, honey-baked ham and fresh veggies, and served with a jumbo chicken sausage, buttered corn and baked beans. And tell you what, we both agreed this savoury waffle is much better than Bananarama! You also get to choose 2 sauces for the sausage, to which Sa chose BBQ and Mustard. Other than the buttered corn, which we found to be way too watery and not buttery enough, the rest of this dish was just plain yummy! First up, you can't mess up baked beans and you don't see me complaining much about sausages/bratswurts (apart from just once when I had some squishy gourmet sausage at TTH) so it's really all about the waffle-wich. It's really surprising that even though the waffles they're using to make this waffle-wich are plain, they're actually still (mildly) sweet in nature (because they're waffles!) 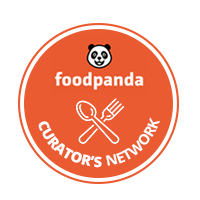 and yet it doesn't complicate the savoury taste of the honey-baked ham and parmesan cheese! The waffles here are much crispier and drier compared to the one in Bananarama, somehow mimicking the dry toasted feel of a sandwich bread, which made the toughness of the waffles here much more acceptable than it usually would for a sweet waffle. However, eating a waffle-wich is definitely 2x messier than a sandwich, for the waffles are almost twice as thick as a normal toast. I actually cut a tiny bite off and stuff them layer by layer (top waffle, fillings, bottom waffle) into my mouth before I savour them. HA HA HA! A nice trick for ladies with not-very-big-and-spacious mouth cavity. 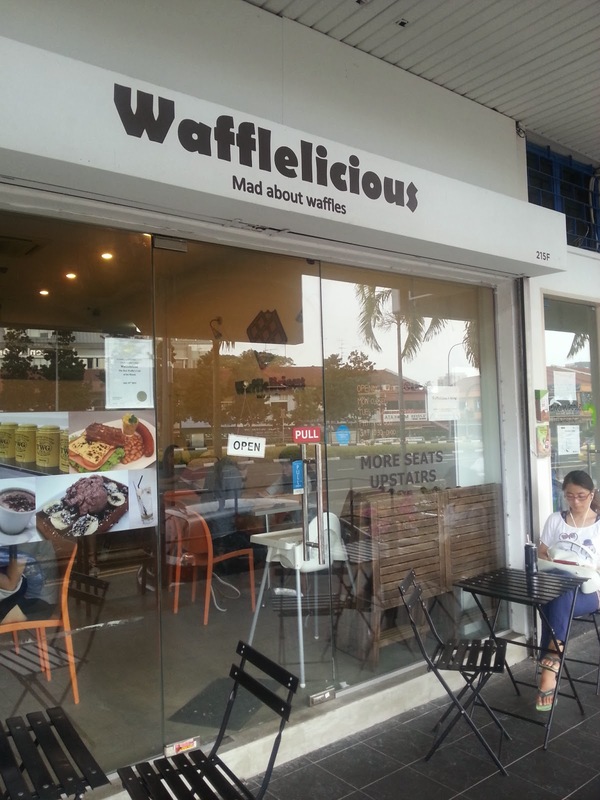 For more information on Wafflelicious, visit their Facebook or Blog for more details.